Restaurant must be located within Bucks County. Must offer either a $25 or $35 set, three-course, prix fixe dinner menu. Each menu must offer at least one appetizer, entrée and dessert. Menu must be a depiction of the restaurant’s specialties, chef’s culinary talents, house favorites. Menu pricing ($25 or $35) does not include beverages, additional menu items, tax or gratuity. Menu must be offered throughout the entire course of the program (Sunday-Saturday). Menu must be printed and provided to each customer during the course of the program. Menu exclusions (beverages, additional menu items, tax, gratuity) must be included on all menus. Menus must be submitted to KelleyK@VisitBucksCounty.com no later than Friday, February 22 to be included in Visit Bucks County Restaurant Week. Menus that are submitted after this date are not guaranteed to be posted live on the Visit Bucks County Restaurant Week website for the program launch. New for 2019! Once your menu is received, Visit Bucks County will be sending you an editable PDF of your menu for you to print for your guests. Restaurants must educate all servers on the program terms and details to ensure high quality, knowledgeable service for consumers. Restaurants are able to offer their full menu in addition to the Visit Bucks County Restaurant Week menu. Restaurants are required to visit their current listing on the Visit Bucks County website and make appropriate changes/updates to their description, photos, amenities and social media pages via the partner extranet. The Visit Bucks County website listing will be used on the Visit Bucks County Restaurant Week website. For more information on accessing The Hub, please contact Kelley Keeling. Please be aware that your restaurant’s name will appear on the Visit Bucks County Restaurant Week page as it does on your listing on the Visit Bucks County website. Restaurants are required to track the number of Visit Bucks County Restaurant Week menus served over the course of the program. Restaurants will be asked to complete a post-event survey (sent from Visit Bucks County) to gain feedback and data on the success of the program. Restaurant are required to display marketing materials (provided by Visit Bucks County) in their restaurant beginning Friday, March 29. Restaurants must promptly resolve any significant customer complaints brought to their attention by Visit Bucks County. Restaurants agree to not promote their participation in Visit Bucks County Restaurant Week in advance of the release by Visit Bucks County unless authorized by Visit Bucks County. Once the application process is complete, restaurants agree to honor their commitment to participate in Visit Bucks County Restaurant Week. Any application fees collected will not be refunded. 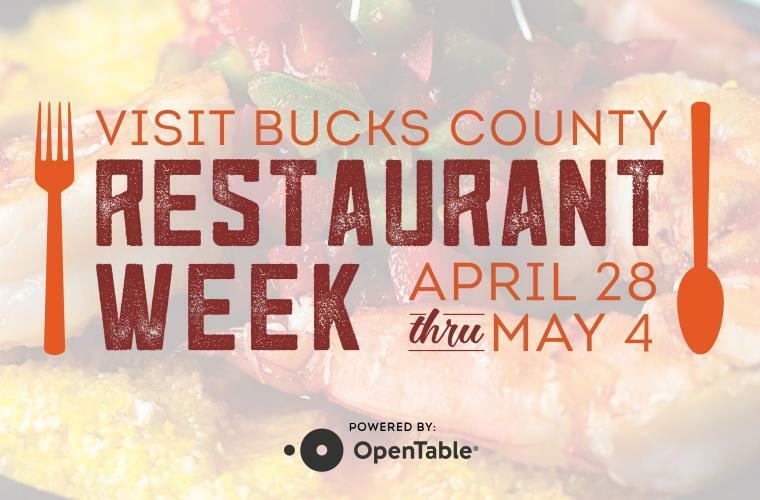 Restaurants agree that Visit Bucks County can name their restaurant as a Visit Bucks County Restaurant Week participant and include their logo and/or name in any promotional materials. The application process has been extended.